Please excuse the blur. No, I wasn’t going to retake the photo. 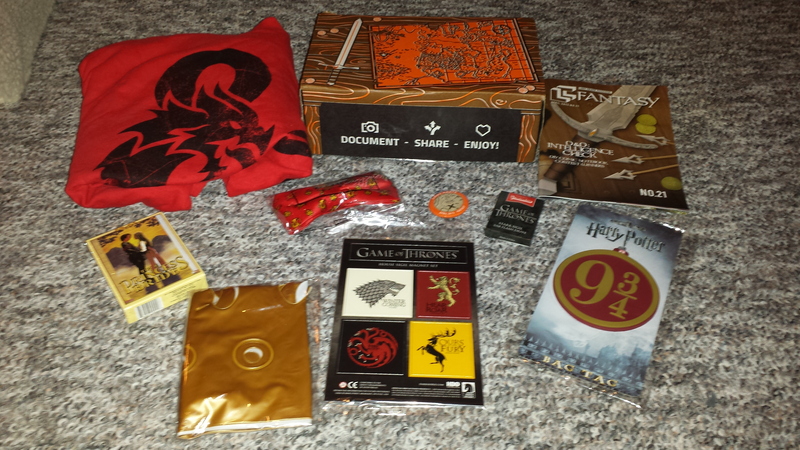 Okay, so there’s thing called Loot Crate. It’s subscription service that you sign up for online (there’s various subscription levels) and they send you a box of geeky junk you don’t really need every single month. With a recent promotion at work, I’ve had some disposable income so I figured it’d be fun to sign up for after watching a bunch of “unboxing” videos on YouTube. What’s genius about all of these box subscriptions services is that they all get unlimited free advertising. These companies encourage their customers to blog, tweet, Instagram, and YouTube about their goods. And what geek can’t resist the urge to review something on a blog or YouTube? Who knows, maybe some day I’ll take the YouTube plunge and do video reviews (under a mask or something) but until then, I’ll stick to spilling digital ink.